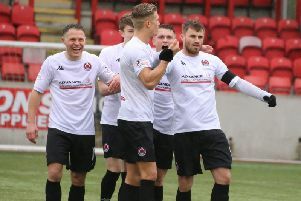 Two goals from Salim Kouider-Aissa ensured a fairly comfortable passage through to the third round of the Scottish Junior Cup against Livingston United on Saturday. Although it took the visitors some time to settle and eventually dominate the game, Kouder-Aissa - undoubtedly the best player on show on the day - came up with a double which did the job. Livingstone started quite well and probably had slightly the better of the opening quarter of an hour. Their best chance came when David Tait had to dive at the feet of Bryan Jaconelli to prevent a score. The strong crosswind was making it quite difficult to control the ball but eventually Rangers began to dominate and find their men with passes. Phil Dolan was making a few good runs and put in a few shots, although they did not really trouble keeper King. However Rangers did go ahead after 26 minutes, Jordan Pirrie putting over a fine cross for Kouider-Aissa to head home. The one goal margin was a fair reflection of the first half and Rangers also made a good start to the second half. And when Pirrie he was taken down in the box, Kouider-Aissa made a good job of converting the resulting penalty to put them two up. More comfortable with the two-goal cushion, Rangers had easily the better of the second half and now await the third round draw with interest.